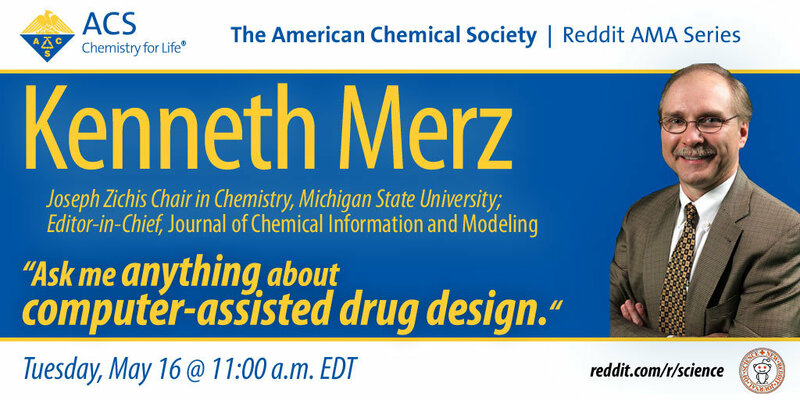 On May 16, ACS Publications hosted a Reddit AMA session with Professor Kenneth “Kennie” Merz, Editor-in-Chief of the Journal of Chemical Information and Modeling. Merz is the Director of the Institute for Cyber Enabled Research (iCER) and the Joseph Zichis Chair in Chemistry at Michigan State University, where his research group focuses on computation and theoretical chemistry, with a focus on computer-aided drug design. This intersection of STEM disciplines offers new and interesting ways of developing tools to fight disease, and Merz has collaborated with pharmaceutical and biotechnology companies to apply his research to real life solutions. /u/iaashish7: How will you Explain Protein Folding to a layman? Professor Merz: Great question and one that I faced at a high school class reunion a few years back! I was talking to an old high school buddy I hadn’t seen for a few years ago and he asked, “So, what do you do” – classic high school reunion stuff – excitedly, I said, “theoretical and computational chemistry, where I use math and computers to understand biological and chemical systems – like drug design or protein folding”. Whereupon my friend turns around and calls Joe over, “Hey Joe, come over here, you gotta hear this….” First you need to make sure that your audience knows what a protein is: Proteins consist of amino acid building blocks that form a 3-dimensional shape that then allows them to convert things like sugars to alcohol. Liberal use of your hands illustrating this seems to work well. Alcohol, as an example, works well too, since more often than not at a class reunion folks have had a few ;-). Once they get that you can tell them that the individual amino acids encode how the overall polymer folds up into its active 3-dimensional object – again liberal hand waving helps. That seemed to work for me, but perhaps my high school buddies were just being sympathetic to my condition – unrepentant geek! /u/wunderforce: As a fellow computational biologist who also develops software (for metabolomics research in my case) I am curious why you chose to patent your software and sell it as a business instead of making it freely available to the scientific community. I am a PhD student finishing up my first piece of novel software that is yet to be published. I would love to hear your perspective on going free and open source vs patented and commercialized. Professor Merz: We could discuss/debate this for literally hours. Personally I don’t think there is one good answer and you should go with what works best for you. If you want to fully open source then great, if you don’t then great – it takes all types to make the world go round. Talk to your friends and colleagues in your field and see what they think is the norm in your field and then decide from there. Decide what you want to achieve – gain academic visibility for your work (citations!) or make money off of your endeavors. Maybe you open source your work for academics and charge companies. So many variations LOL! /u/Micp: As a teacher I’m always interested in hearing the experts: What do you know that you think kids should be taught in school? (K12) What do you wish your school had prepared you for better in your field? Professor Merz: Personally, I think we should have kids take more math. Math is key to my field and to the future of the US. Hence, we need to step up to the plate and realize this is where we are. Rather than rote learning, I wish that problem solving would of been taught more in K-12. Working on a problem that requires working your way through it and bringing in information from disparate fields make learning so much more fun and better reflects the real world. In the end, we must take what we learn and apply it to solve problems! /u/true_spokes: There’s a lot of concern over designer drugs and how to regulate them when commercial labs can produce new versions with only minor tweaks to a few functional groups. As someone who works on the design side, how would you propose regulating this type of innovation moving forward? Professor Merz: Take the opiate problem that has gotten a lot of press recently. The literature is full of derivatives of opium and a simple rule was formulated to make derivatives (the Morphine Rule); hence, folks looking to circumvent this class of controlled substance has a rich vein to mine. The initial hope was by increasing the potency of derivatives the addictive character of these compounds would go away – an outcome that did not happen. I guess this is a long-winded way for me to say I have no idea how to deal with this scourge besides regulating this class of compounds as best we can and to stay informed. /u/Eroitachi: Hi Professor, Really appreciate you taking the time out of your day to educate us 🙂 I’d like to know what would you say are the most promising areas (both in terms of career growth and future discovery/contribution) that a biochem undergrad student should focus on heading toward? Thank you! Professor Merz: Great question! What I preach to my graduate students is to be flexible. By getting a STEM degree you are becoming a world-class problem solver and, as we all know, the world needs problem solvers! For example, my students have grown into a number of different careers by being flexible. Some work for computer or internet companies, some work in pharm/biotech, some work at universities and some work in financial/insurance companies. In the end, follow your heart and follow your nose. Do what you love and more often that not it will work out. Sometimes following the hot field can be good or bad – realize what is hot today might be cool tomorrow. When I entered grad school and decided to do theory/computation my classmates thought I was nuts and was headed to ruination. Five years later computational chemistry/biology took off and the rest is history. Learn more about the ACS Reddit AMA Series and see upcoming sessions, click here.